I wish to gain profound knowledge of and insights into environmental issues with the aim to make a better livelihood in our region possible. Interviewing Tajik local officials on a topic of transboundary conflict over pasture resources between Tajikistan and Kyrgyzstan. In 2012, I started to work in the sphere of natural resource management with the Kyrgyz NGO, CAMP Alatoo. We promote the improvements of livelihoods of Central Asian communities, based on integrated natural resource management. In the frame of a three-year project on conflict management over pasture resources in the south of the country, I support the mitigation of conflicts over pastures raised by post-soviet vestiges, weak management and vague legislation. The region is very vulnerable since there are very little alternative resources for income generation except livestock keeping and some cropping. Within the project, I act as a researcher, extension worker and facilitator. I have been working with the local population and different state and non-governmental agencies which have direct relations to the management of natural resources on local and national levels. CAMP Alatoo implements a range of activities aimed to raise awareness and strengthen community’s capacities to manage resources in an efficient manner. Also, we strive against such challenges as the conservative mentality of stakeholders, the inflexibility of systems arranging frames for pasture use as well as the complicated transfer of the local needs to decision-making government officials. Presentation of the recommendations for mitigation of conflict over pasture to local Pasture Committees and officials. Another direction I am dealing with is climate change (CC) adaptation. The influences of CC on natural resources became more evident over the last decades. Currently, I am integrating the “climate proofing tool for development”, which was elaborated by The Organisation for Economic Co-operation and Development (OECD), into the project cycle of a project on biodiversity conservation and the sustainable management of walnut forests. 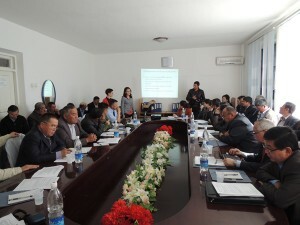 I had previously already participated in the training of multipliers of the tool and was involved in the application of climate proofing to a pasture project implemented in Uzbekistan and Kyrgyzstan. Additionally, CAMP Alatoo plans to integrate the tool into all our projects in Kyrgyzstan (CAMP Alatoo) and Tajikistan (CAMP Tabiat, our Tajik branch). Finally, I am an environmental researcher who wants to gain more knowledge on various approaches and instruments of natural resources management and am willing to cope with the obstacles raised in achieving sustainable natural resources management.